Women’s basketball: The Terriers look to make it two in a row with a win tonight over the Knights. After a blowout win over the Central Connecticut State Blue Devils, the Terriers will look to get on a little roll as they take on the last place Fairleigh Dickinson Knights. The Terriers put together a very nice performance their last time out, knocking off the Blue Devils 71-50. 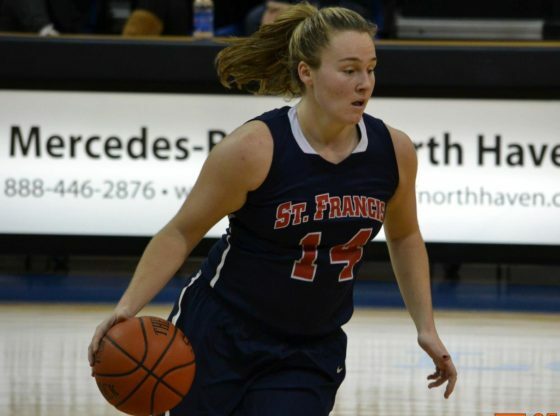 They were led by Junior forward Sarah Benedetti who scored a team high 17 points off the bench. It was nice to see Bennedetti get going after she struggled in the previous three games. These two teams last met on January, 6th, where the Terriers squeaked away with a 57-55 victory. On that night the Terriers were led by Junior forward Jessica Kaufman who scored 14 points and grabbed 8 rebounds. Sophomore guard Leah Fechko also put together a nice game scoring 11 points and pulling down 8 rebounds of her own. The Terriers must contain two players that hurt them in their last meeting. Sophomore forward Brianna Thomas went for a game high 18 points. She is a dyamic scorer that the Terriers must shut down tonight. For the season Thomas averages 13.0 points per game and 4.8 rebounds per game. Another player who hurt the Terriers in the last meeting was Senior forward Desiree Crawford. Crawford scored 13 points and grabbed a game high 12 rebounds. She proved to be a beast in the paint, grabbing a plethora of rebounds and finishing off some easy layups. Tonight the Terriers must play their game of ball if they want to come out with the win tonight. They must play their style of lockdown defense which, they have all season long. Including tonight the Terriers have nine games remaining, with their recent three game slide each of the games will be just as important as the last. They come into tonight’s game with a (14-6, 5-4 NEC) record. In order to keep pace with the rest of the conference they must take care of busniess night in and night out. This should be an exciting game despite the Knights (1-19) overall record, they are a gritty team. The Terriers should not take them lightly especially since they almost lost the last meeting. The Terriers must play hard and smart, limit their turnovers and convert on easy opportunities. MTA: DON’T GIVE US THAT TRASH!